Today is the final day of production for the Chrysler PT Cruiser. Once the shining star and gotta-have Chrysler of the moment, the much-neglected PT has finally been put to rest. It serves as a perfect demonstration of Chrysler's failings. The Chrysler PT Cruiser has shuffled off its mortal steel coil after nearly eleven years of production. Eleven years without much more than an indifferent front-end refresh and one sorta-new engine. The PT chapter closes not with a happy note, but with rather a somber reminder of what happens to a great nameplate when it falls between the cracks of program management. The PT began its life under both Chrysler and the now-defunct Plymouth brand. Remember 1999? Back then, SUVs and big pickups were the hottest thing on the planet — an automaker couldn't put out a bad one, no matter how ridiculous, unreliable or fuel-hungry it was. That's where the PT Cruiser came in. Even though it shared bits and pieces with the Dodge/Plymouth Neon, and even though it sported a relatively small 2.4-liter inline four, it was classified as a pickup. This was, of course, a trick. With a flourish of the PT's flat passenger-compartment floor, Chrysler had wiggled into a back door of regulation that allowed the PT Cruiser into the CAFE fuel-economy game as a ringer — it was considered a truck. That was the plan all along, but they weren't counting on the wild success they had with the car. By 2001, the cars were everywhere — you couldn't swing a blown head gasket without hitting one —by the end they built a grand total of 1,355,484 units. With a low base price, a spunky 150-hp engine, then-popular retro styling, a relatively huge interior, and no-nonsense usability, the car sold like hotcakes. It was a breath of fresh air in a stale (incredibly stale) small car market. The car even made Car&Driver's Ten Best list in 2001, fer chrissakes. But Daimler didn't like it. Following the Daimler takeover merger with Chrysler, the Germans wielded a lot more decision-making power, and they held the purse strings on product development. Much higher-margin products were greedily eyed in order to turn a quick profit. What should have been a three- or four-year product cycle was stretched and elongated. 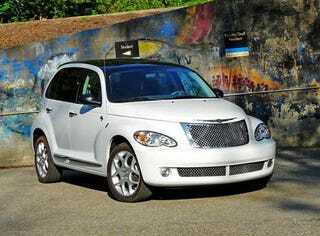 The PT Cruiser was subjected to special edition after special edition, the first of which was clever and well received, but after a while it was putting lipstick on a pig. In 2005, the PT needed a mechanical update but got a nonsensical convertible version instead. A barely noticeable facelift and freshened interior arrived in 2006. The 180-hp PT Cruiser Turbo came later and briefly spiced things up, but it was quickly lost in a sea of better, more powerful cars. In 2008, the neglect really began to show. The PT received the unwanted title of Most Dangerous New Small Car in America from the IIHS as safety regulations passed the PT by while no engineering money came its way. That same year, rather than making any substantive engineering improvements, Chrysler unveiled its fifth Dream Cruiser special edition. And that's how it's been for the last few years: sticker and trim packages on a rapidly aging, increasingly incentivized, once-popular car. As it sits on dealer lots now, it's a bad car — totally uncompetitive, harsh, and outmoded. It's sad, really. The car that once proved America could build innovative small cars, the one that really birthed the compact crossover segment, allowed to wither while vehicles like the disastrous Chrysler Aspen Hybrid gulped down development money. The successor in a way would have been the Dodge Hornet, but that failed before it was even born. The PT is a victim of fortune, of poor planning, of too many changes in management direction, too many sales and mergers. It's exactly the kind of thing that led to Chrysler's bankruptcy. In truth, from an enthusiast's perspective, it was a tough car to love. The PT was a shrunken minivan, a bloated Neon, a car for families who needed something basic and leaned a little too hard on nostalgia. But even we have to admit that, in the car's heyday, it was great. After watching all the injustices over the years, we're kind of glad that it's been put to bed.